Can You Take Ibuprofen With Vitamin B? Can You Take Vitamin E & Aspirin Together? Can You Take Other Pain Meds Along With Celebrex? Vitamin C is a water-soluble vitamin essential for the repair and maintenance of connective tissues, including muscles and tendons. As an antioxidant, vitamin C inhibits free radicals that may contribute to heart disease and arthritis. Ibuprofen is an over-the-counter medication often used to treat symptoms of fever, muscle aches and arthritis. Both vitamin C and ibuprofen may help various conditions, but ask your doctor before trying any new medication or supplement. Since your body cannot make vitamin C, also called ascorbic acid, you must get your daily requirement through food, beverages or supplements. Vitamin C is essential for the making of collagen, a structural component of tendons, muscles and bone. The recommended dietary intake of vitamin C for healthy adults is 75 mg for women and 90 mg for men, according to the Office of Dietary Supplements. Eat fruits, vegetables and fortified cereals to obtain your daily amount of vitamin C.
Ibuprofen is a nonsteroidal anti-inflammatory drug, or NSAID, used to reduce inflammation due to minor injuries. Doctors sometimes prescribe ibuprofen to reduce the swelling, pain and inflammation caused by arthritis. NSAIDs may work by reducing chemicals in the body that contribute to inflammation without the use of steroids. Ibuprofen can increase your risk of stomach irritation, so tell your doctor if you have a history of ulcers. Taking ibuprofen with food can lessen your chance of nausea and gastrointestinal symptoms. Ibuprofen may also increase your risk for heart attack or stroke, so discuss dosage instructions and adverse reactions with your doctor. A study published in the December 2008 issue of the “International Journal of Molecular Medicine” revealed that vitamin C may have anti-inflammatory properties much like ibuprofen. The study showed that vitamin C coupled with other antioxidants performed as well as ibuprofen against inflammation. A previous study published in the November 2008 issue of “U.C. Berkeley News” revealed that vitamin C significantly reduced inflammatory markers for participants with chronic inflammation. The Berkeley-led study also noted that vitamin C was as effective as some prescription medications for arterial inflammation. Vitamin C has a low risk of toxicity, but taking excessive amounts can cause diarrhea, nausea and abdominal cramps. Talk to your doctor if you take statin drugs because vitamin C may interfere with absorption. Both ibuprofen and vitamin C supplements can cause stomach upset in some people, so take these medicines with food or milk. 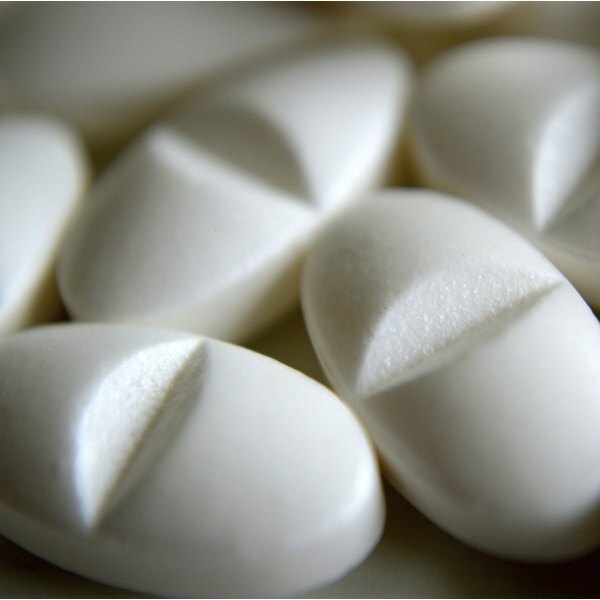 NSAIDs like ibuprofen can increase your risk for stomach ulcers, heart attack and stroke. Always ask your doctor before taking any new medication or vitamin supplement. Roseanne Omalacy became a published author and freelance writer in 2006. She is the author of several novels and has been published with Literary Partners Group, Alyson Publishing and "Scarlet Magazine." She is a Pittsburgh health and relationships columnist, holds a bachelor's degree in nursing from Pennsylvania State University and has over 15 years of nursing experience. Can Vitamins Help Shrink Cancer Tumors?